Today I will be focusing on Grixis Control. Where it came from, the challenges it faces, how it can respond to the new Modern landscape we find ourselves in, and what role it will play moving forward. For those unfamiliar with my opinions on this deck, you can brush up here, here, and here. My renewed interest in Grixis Control is the result of two providential events: the banning of Eldrazi, and the unbanning of Ancestral Vision. Eldrazi as a broken archetype did many things to the metagame, but its most lasting impact has been the polarization of the archetype spectrum away from combo and towards linear aggro. With Eldrazi gone, these combo decks can come back, but they now have to focus on combating a proliferation of linear aggressive decks. These slight metagame shifts benefit Grixis Control twofold—by removing the focus from control which will allow it to flourish, and by filling decks with interaction aimed away from control and towards aggro. With Ancestral Vision suggesting the possibility of a fairer, viable Treasure Cruise in Modern geared specifically for control decks, the stars have never aligned so well. Let’s start by looking at where we’ve been. The birth of Grixis Control can be traced to GP Charlotte, in the hands of Patrick Chapin. On June 15, 2015, Chapin narrowly missed Top 8 with his fresh look on a control archetype in Modern focused on the powerful synergy between delve, Thought Scour, Snapcaster Mage, and Kolaghan’s Command. In the almost full year since his finish, the archetype has gone through multiple iterations, but I remain convinced that the key to Grixis’ success in Modern lies somewhere within this shell. Abundant interaction. Chapin’s version of Grixis Control capitalizes on cheap removal in excess to disrupt opponents and gain advantage wherever possible. By crafting the game to a state where the opponent’s resources are almost depleted, Chapin is able to pull ahead through the use of his ten two-for-one’s (Cryptic Command, Snapcaster Mage, and Kolaghan’s Command). Instant-speed gameflow. Chapin built his deck to play true draw-go, with only nine sorcery-speed spells. Serum Visions and delve creatures like Gurmag Angler and Tasigur, the Golden Fang can often be cast for one mana, leaving most of Chapin’s mana free to interact with the opponent on their turn. This list is clearly focused on putting opponents in the classic control squeeze: do something, it will get countered/killed; do nothing, you play right into control’s gameplan. This list takes pronounced advantage of “free” mana, casting Kolaghan’s Command or Cryptic Command whenever possible to gain material advantage and restock on cheap interaction. “Cheap” win conditions. If you can call them that, because no “actual” win conditions are present in the list. Delve creatures function as excellent blockers that could turn the corner and hit hard when ready. Resolving Cryptic Command doesn’t end the game immediately, but often puts the opponent at a significant enough material disadvantage that defeat is assured. The strength of this deckbuilding choice lies in its elasticity; rather than set up a pivotal turn or strategy, it focuses primarily on casting spells and making efficient use of mana. To give context to the above list, we must remember that Chapin’s Grixis existed at a time when Splinter Twin, Tron, Burn, and Affinity were the top players in the metagame. Amulet Bloom had just had its breakout party, and Grishoalbrand was much less common than Living End or Scapeshift. Towards this perceived metagame Chapin’s Grixis was geared—abundant cheap spells and interaction focused on pushing gameplay into the midgame where two-for-one’s are king. Jace, Vryn’s Prodigy. When supported by a 75 that unlocks his full potential, Jace one of the most powerful cards you can cast in Standard or Modern. While it fails the Lightning Bolt test, Grixis Control wants nothing more than for opponents to keep in cheap interaction that fails to kill delve creatures. Jace, Vryn’s Prodigy has incredible synergy with the foursome of Thought Scour/Snapcaster Mage/Kolaghan’s Command/Gurmag Angler. In addition, Grixis can take advantage of every one of Jace’s abilities, looting, flashing back spells, invalidating small creatures or shrinking opposing Tarmogoyf’s, and even winning the game with his ultimate. And by his ultimate, I mean flashing back two spells. That’s generally all it takes. Prioritizing cheap spells. Cryptic Command as a focused strategy is potent, but difficult to accomplish easily. Cryptic Command in hand goes against every facet of the archetype, and plays at odds with the primary strategy of Grixis: casting multiple, cheap spells. As a result, Cryptic Command often feels awkward and the player is pressured to cast it at the first possible opportunity. Diverse reactive spells. Jace, Vryn’s Prodigy plays best with multiple options to choose from. Discard helps assure he lives (or just takes their best spell) and is a great target to get double use from, especially when we’re casting multiple Kolaghan’s Command as well. Jace, Vryn’s Prodigy, while powerful in the above list, exists only as a means to an end. If he dies, he dies. Jace can be pushed, however, from deckhand on a well-built ship to captain of a machine of war. Jace, Vryn’s Prodigy as a core component. Danny Jessup included multiple pieces of technology developed in large part by Michael Majors and others: Rise // Fall, Liliana of the Veil, and discard in high numbers. Jace, Vryn’s Prodigy doesn’t play well with counterspells and can only make partial use of instants in general, so many players moved towards a Jund-style build, focusing on casting the most powerful thing possible turn after turn, but with synergy and cantrips instead of Tarmogoyf. Pia and Kiran Nalaar as a stabilizer/win condition. Depending on your opinions on the card, Pia and Kiran Nalaar’s inclusion is a testament either to the awkwardness of the archetype or the strength of the strategy, but it can’t be both! More clunky than Cryptic Command, Pia and Kiran Nalaar at best provides four power spread among three creatures for four mana, and at worst a bunch of chump blockers. Proponents argue that letting it die and getting it back to recast with Kolaghan’s Command or Rise // Fall is gamebreaking, but given that freedom the control deck should be winning anyway. This brings us to today. We see that Grixis Control historically has been built in one of three ways: draw-go, Grixis with Jace in a supporting role, or Grixis Jund. Today, I have two lists for you to check out (or dream nightmares about facing). Your choice! This list is an update to the “Jace as a tool to use and abuse” style of Grixis Control that I have found the most success with. You won’t see any Rise // Fall or Pia and Kiran Nalaar here, just solid, synergistic cards that come together to form a cohesive strategy. It is essential to view these Grixis lists as more than just a pile of removal and value cards thrown together. While any player can find success with a solid list and a couple changes, the deck performs vastly different once you start to change four or more cards. Thought Scour or no, draw-go or no, discard as a question mark, the mix of removal, the number of four-drops, the focus on delve—these are all questions that need to be answered and players new to the archetype can quickly fall into some deckbuilding traps. While it might look simple to add a singleton Tasigur, the Golden Fang to a Grixis list, the presence of other four-drops (or lack-thereof) can greatly influence the effectiveness of that decision. I was not an early adopter of Kalitas, Traitor of Ghet and Goblin Dark-Dwellers in Grixis (in fact, I solidly opposed their inclusion from the beginning) but the availability of Ancestral Vision has forced me to come around. Goblin Dark-Dwellers recasting Ancestral Vision is the ceiling, but the floor isn’t that bad either. When we are building with Ancestral Vision in mind, we need to take into account games where we don’t find it, or it gets countered or Thoughtseized. In those scenarios, we need some sort of Plan B to pull ahead. A 4/4 and a free re-bought spell on Turn 5 is not a bad backup plan when we can’t draw three cards like we hope. In addition, Goblin Dark-Dwellers plays great alongside Jace, Vryn’s Prodigy discarding Ancestral Vision. A drawn Ancestral Vision in the midgame can be extremely awkward, but instead of waiting four turns for it to come off suspend we can discard it to Jace, Vryn’s Prodigy and rebuy it for free a turn or two down the line. Kalitas, Traitor of Ghet is also much better when we’re playing for a grindy, accumulated-value strategy. Getting one free Zombie will often be good enough, and we have the possibility of getting many more. The floor is just a 3/4 lifelink creature for 2BB, which isn’t too embarrassing when we consider the effect it will have on our opponent’s post-sideboard decisions. If they cut large removal, Kalitas can take over the game, and if they cut small removal, they’ll be interacting with Jace, Vryn’s Prodigy at a disadvantage when they’d rather be spending time and mana racing our Ancestral Vision. When we’re including the above heavy hitters we can cut Tasigur, the Golden Fang and Gurmag Angler, not because they are poor options, but because that allows us to cut Thought Scour as well. While we definitely could play 10+ blue draw spells, we won’t have as much time to cast things like that when we’re trying to survive to get our Ancestral Vision off suspend. There’s also the issue of making our velocity high enough to take advantage of the draw-three. One of the major reasons I’m not interested quite yet in including Thopter/Sword alongside Ancestral Vision is the awkward draws that can come as a result. When our back is against the wall, we don’t want to draw into land-combo piece-counterspell. In an Ancestral Vision Modern, Remand is absolutely insane. I already loved this card, and pre-Jace, Vryn’s Prodigy lists often played at least one, but we have a strong reason to go up in numbers should the metagame break the right way. It’s poor against aggro, but then again so is Mana Leak. Against control and Ancestral Vision however, Remand is now just as good or better than Dispel (previously in the conversation for best blue spell in Modern). Finally, I’m not sure about Liliana of the Veil in a format where people are drawing three cards. It will be interesting to see where the true “fight” comes in control mirrors—letting opponents draw three and focusing on their actual threats, or fighting over their Vision. Regardless, a repeated effect when we’re looking to grind is still excellent, and I imagine Liliana of the Veil is still solid, if diminished. Apply this thinking to Jund and I’m not too excited to be playing that archetype until they show me some breaker for the control matchup. Thing in the Ice is a little more speculative but I’m confident it will see at least some play in Modern. Both Matthew Nester and Dylan Donagan opted to play Thing in Baltimore, and it looks like it served them well. What I love about Thing in the Ice is its casual solid positioning against an overly aggressive field. A Wall of Omens that can bounce our opponent’s board and attack for huge chunks of damage in lieu of drawing a card sounds great if we expect to run into a bunch of Wild Nacatls and the like. We don’t have to jump through any hoops to give Thing in the Ice a chance to greatly affect the game—we just have to play spells (which we were doing anyways). There’s a limit to how many interactive elements we want when we’re playing Thing, and the same goes for expensive spells, but just chaining cantrips and removal will activate Thing quickly. In a build like this we definitely want to be chaining spells as often as possible, so Thought Scour is back in. This ensures we won’t run out of things to do to thaw Thing in the Ice. Firing off a Lightning Bolt leaves us down a card, but cantripping into another spell lets us keep chugging. Without Jace, Vryn’s Prodigy in the list, Desolate Lighthouse helps us loot away a late-drawn Ancestral Vision should we need to. Keep in mind that Izzet Charm can also provide this effect. As a fresh Ancestral Vision player, one of the most exciting aspects I’m looking forward to is thinking four turns ahead, learning when to suspend Ancestral Vision and when to throw it away in search of something faster. It’s still a little too early for any definitive analysis of this new Modern, but initial results look interesting. Scapeshift seems to benefit greatly from Ancestral Vision as well, and it will be up to Grixis Control to keep Scapeshift in check while also beating up on the numerous aggressive decks running around. If Affinity, Scapeshift, Jund, Infect, and Abzan Company remain at the top, Grixis Control has a real shot to be a major player in this new Modern. Should Merfolk, Burn, and pure control rise up, Grixis might be in trouble. Still, I’m excited to start tuning and I’m looking forward to crushing fools on Magic Online under an onslaught of card advantage! What do you think about Grixis and this new Modern? Let me know in the comments, and I’ll see you next week! As long as there are creature-based aggro decks trying to slip under control and make sure that they never live to see the T5 upkeep they need for Ancestral Vision to resolve (and those aren’t going anywhere), Jund will live on. Liliana may be somewhat diminished in its ability to shut down control, but it’s not dead yet, and it can do the job in any hand that’s backed up by enough creature density and/or targeted discard to force a control player to go trade 2-3 cards before she lands. Jund is the #1 deck in Sheridan’s way-too-early meta analysis, and while I don’t expect it to retain 11% of the field, I do expect it to remain a Tier 1 deck, and to have a respectable control matchup. On the Scapeshift front, I think Ancestral Vision doesn’t quite strike the right chords for the deck. For example, the SCG Modern Classic at Baltimore over last weekend had 2 Scapeshift decks in the Top 8, and neither had any Ancestral Visions. I also doubt that it was an issue of availability – the Grixis Control players at that same event managed to get their hands on 4 apiece. Vision skews what was already a slow deck even slower, and I don’t think that’s the way to go. 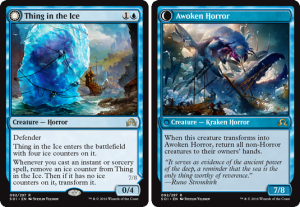 You make good points, I’m inclined to believe for now that a Thing in the Ice list should be focused on maximizing that spell, it seems to require a little more as far as deckbuilding than something like a singleton Tasigur, the Golden Fang that can be slotted in without much thought. I think Ancestral Vision out of the board of Scapeshift for post-board games against control is quite potent, it makes Remand a necessity in that matchup where there were only ever a few spells of your opponent’s that you were looking to Remand. Scapeshift often is well set up to just wait a few extra turns anyways. Another question when building grixis is where you want to be on the tap-out and discard or draw-go and counterspells axis. Absolutely, and for me I think it depends entirely on the metagame. If the context seems to be as hyper-aggressive as it has been, Remand and the like are pretty bad. When exactly do you plan on streaming some new Grixis? I am greatly excited to see it in action. Also a singleton slaughter pact is a house in any deck with kalitas. Swap out a terminate with one of those bad boys and you can get some pretty sweet turns. Once finals are over I intend to get back to streaming as much as possible! Thanks for asking and I wish I had time to spare for it now. I liked your first list of visions grixis. Wouldnt you think 2x Vendilion Clique would be better than 1x Liliana and the drop for tribute to hunger. I will sleeve your list with this modification just to see how it goes. That sounds good, I’ve always been a fan of both those spells (LotV and Tribute) but I can see where they can be kinda poor in some situations. Regarding your concerns about Merfolk (and possibly with applications to aggro, Affinity, and Thoptersword) I’ve been experimenting with Jaya Ballard, Task Mage in a Temur Pyro shell. So far she seems quite solid in this metagame in a UR/x shell that can protect her. She gets added value when you have Tarmogoyfs, Delve, and/or Snapcasters/Jace, Telepaths Unbound to make use of. Might also be a valid sideboard card here. This is a really great article, I’m looking to build a Grixis control list of my own very shortly and these lists have given me some great ideas. I myself like the lists with the ~4 Delve creatures. I think it allows for more option of changing your play style depending on your opponent to be more tempo or more control. Especially with cards like thought scour. It looks to me as though the lists’ following that follow a more strict control heavy playstyle with lots of card draw( Probably the ‘oh snap, Jace is super good when he sticks! let’s have 4 so he always sticks!’ philosophy) . But, Aye, that’s just me. I really like the flavor of Thing in the Ice, it’s a really cool card. although, I have my reservations about it for it to be truly competitive, at least within a grixis shell. My problem with it is that, it kind of just sits there and has to stick, and you have to protect it. Which is fine, but I am not so sure it will consistently be able to be protected, whereas ideally, the delve creatures and the other utility creatures in these lists can have an immediate impact to the game. The delve creatures and kalitas need to be dealt with immediately if the opponent has any hope of winning, and snapcaster’s /dark dwellers/ Jace allow you to find/use what you need to keep control of the board/opponent. Thing in the nice is none of those things until you cast your 4th spell after spending two mana to get it no the board to begin with. I guess I’m saying I don’t like a win condition that can ever have the possibility to be ignored. I feel like if its your playstyle to want your win condition to hit the board, and you just play with your opponent to try and keep it sticking, then maybe a list that would normally support a young pyromancer with this in its place may be better, or just this in a UW control list in general would be a better home than grixis. But, maybe I’m wrong, maybe ancestral visions will allow it to be played at a tempo similar to the delve creatures with more ouch.